Having trouble with (I think) the tripping mechanism when the needle/arm gets close to the end of the record it causes the needle to remain in the same groove and keep playing the same thing over and over. I removed the turntable and saw the tiny thin multi-layer linkage on the right side which is activated when the arm moves to the center to trip the changing mechanism. I carefully removed this assembly, cleaned it with alchohol and put it all back together but still have the same problem. Is there something underneath I also need to be fooling with or cleaning? Aggravating. Other than that the changer works perfectly and sounds great. Any help would be appreciated. Thank you. Have you checked the tracking force? What kind of cartridge is in the turntable? Also..make sure there isn't any wiring or a spring inside the arm of underneath that is binding when the arm is at the end of the record. If all looks OK, and I don't normally recommend this...put a penny/dime on the arm head and see if it works 'normal' just to see if it will track to the end of the record. If it now does work right and none of the previously mentioned things are wrong...the needle could be going bad and not tracking. This is a very common problem with a lot of turntables. There is a small trip pawl, located in most turntables on the main cam gear, that is moved by the trip link so that it contacts a rotating dog on the turntable gear, starting a reject cycle. The trip pawl can get gummed up where it is mounted to the cam gear. Remove it and clean it thoroughly and see if that helps. Hi Dave...The Miracord design is different from most. The velocity trip is actually a separate assembly mounted on the top of the chassis. You can see it in the attached photo. It's the silver colored parts. They're made of very light aluminum. It might be that the chassis is rough underneath which can cause binding. I used to put a tiny bit of light lubricant or silicon on the chassis when cleaning those. The trips were not as sensitive as on a Dual, but they should be able to work down to about a gram of tracking force when operating properly. Location: ZIP 23831 South of Richmond, VA 25 miles down the pike. I go along with the suggestions, but just what is your stylus pressure? Maybe your records are at fault. Nevertheless do you have the SAMS Photofact data. It's interesting in that SAMS indicates a calibrating weight is supplied to adjust stylus pressure. Could be something there as that has something to do with the balance of the tone arm. If you can use the SAMS let me know and I will scan and link to it. John, thanks for the comment and pic. That trip mechanism does look very different -- seems to be encumbered with lots of linkages and pivots. Maybe cleaning and lubrication would still be a good idea? Yes, I think so. The OP said he already cleaned it, but a few of us have asked about the tracking force and not gotten an answer. Working perfectly, these should still be able to trip at around 1 gram tracking force, which is lower than I would recommend for that arm overall. But of course, if you add in age, lots of things can cause binding. You can see that they treated the surface under the trip at the factory. I think they polished it out in manufacture to minimize friction. If you get any corrosion there, you can imagine what might happen. The fact that he said it skips, leads me to believe the problem lies somewhere around those 2 aluminum velocity trip levers. I had that problem on my 10H. The issue with my unit was there is a strain relief (metal clamp) that holds the tonearm wire exiting the tonearm. If there is too much or too little wire slack it will claw back the arm near the end of the record and cause skipping ad infinitum. In other words, too much slack and the wire actually pushes the tonearm back. Too little slack and the tonearm is pulled forward. All that was required to fix it was to slide the tonearm wire a few millimeters under the strain relief (under the chassis) so the arm could travel freely without the wire being inhibited by the strain relief clamp. I've illustrated the fix in the below photo. I'm referring to the wires with brownish color wrap around it. Last edited by zenithconsole on Feb Sun 18, 2018 4:37 am, edited 2 times in total. If that doesn't fix your skipping, I remembered that I have encountered one other issue that can cause skipping like you are describing. Does it skip at a certain spot on all records? 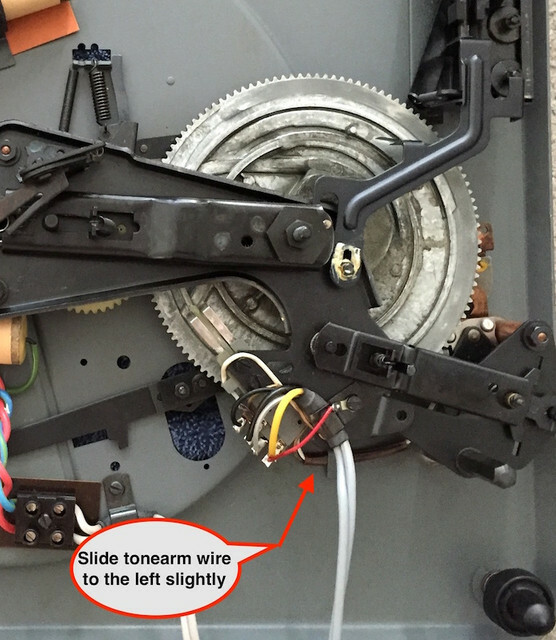 The way I fixed it on my 10H was to make sure there was a 1mm gap space between the tone arm damper as per the Elac service manual (see service manual picture below). My unit didn't have a 1mm gap. It was actually making contact while playing. The damper should only make contact when cycling (keeping the tonearm from bouncing around when it lifts up automatically). However, when playing a record there should be zero contact with the damper. If there is contact while playing, it will drag on the tonearm and cause skipping. 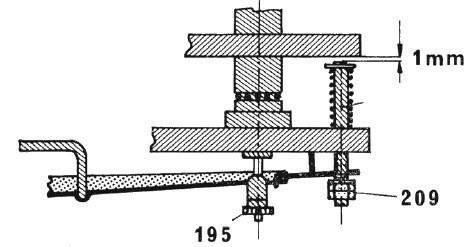 The two nuts in the image below (notated as "209") just lock the long screw into position. In order to move that damping screw up or down to achieve the 1mm gap, you have to unscrew the two nuts. Then turn the screw so it creates a 1mm gap as per the illustration. Then retighten the two nuts to lock that height into place. The two nuts on my damper screw were initially stuck in place. I had to use a hair dryer and add a few drops of 3-in-1 oil to free them up. Once the nuts could be unscrewed, I could turn the main screw and adjust it to make the 1mm gap.